We have been dancing rain dances in Victoria for so long we stopped believing in them. Now the rains have come and they don’t seem to know when to stop. 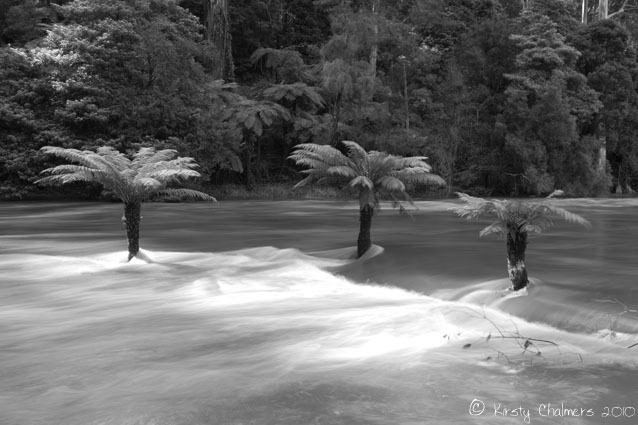 Our beautiful Yarra River is swollen and wild – roaring along and nearly breaking its banks. The weather is weird. Along with the flooding rain we have wild winds and unseasonal humidity. We are learning to expect the unexpected. Kirsty – and here, on the other side of the Pacific, in a different hemisphere, we have just had the coolest summer in recent memory. Yes, expect the unexpected. This is a seriously cool photo, in black and white, and with a slower speed to smooth out the river. Nice one, Kirsty! Glad you got your much needed rain though. lol I think we’re OK for rain right now, but I’ll bear that in mind for the next drought! Oh my!!!! I love the black and white of this image. This is my favorite of the tonal photos thus far. The vertical stature of the trees against the horizontal movement of the water is captivating as is the light/dark contrasts. It’s almost as if the trees are saying, “I can get this water if I drink fast enough!”. Beautiful and captivating, Kirsty. Thanks Leslie, I am tempted to actually print this one as I love it too. As cool as it gets, I love it. Yeah, Kirsty. Somehow those Three Palm Tree Amigos look like cool cats in that raging wild river, it has a great effect. Wonderful photo, and yes, the weather is wild! Thanks Ruby. There’s nothing like a good solid root system to keep you cool when your river becomes a raging torrent!